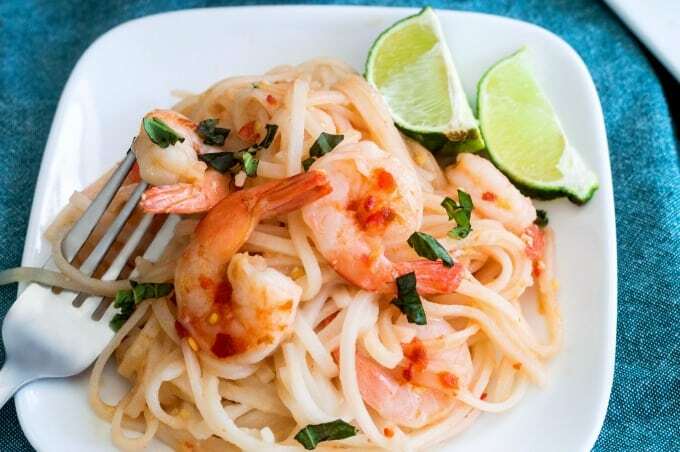 Shrimp Pad Thai Recipe - Authentic flavor in less time than takeout! 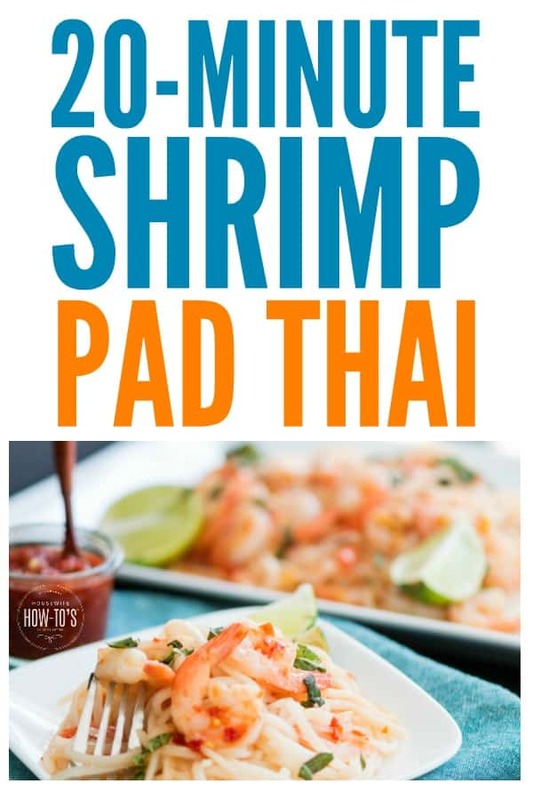 I started working on this Shrimp Pad Thai recipe after my first-ever meal of it at a local restaurant. It was delicious, with just the right combination of spice and heat, and with noodles that were so much fun to slurp. I knew, from the first bite, that I’d want to eat it regularly. But the price? Oh, my. I just couldn’t see paying seventeen dollars per plate very often! 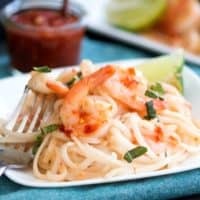 The following week, I began my hunt for a good Shrimp Pad Thai recipe, only to find an over-abundance of those calling for ketchup and Canola oil. Ketchup, really?! And Canola oil when sesame would give it a more authentic flavor? Truly authentic recipes called for tamarind pulp, an ingredient I couldn’t find in my small Kansas town. I had no problem finding the remaining ingredients in the Asian section of my local Kroger’s. If you can find tamarind paste or want to order it from Amazon, just stir in 1 tablespoon. Don’t fret if you can’t get it, though: most Thai restaurants in the States don’t use it, so this recipe will taste just like the one you’ve been ordering all this time. 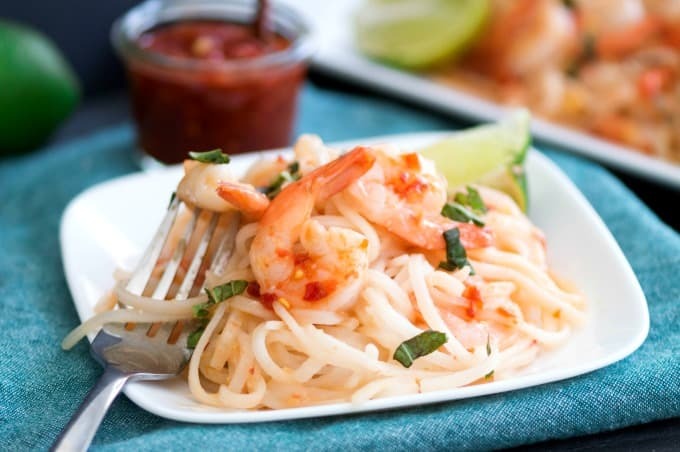 Despite its name, Pad Thai originated in China where it was initially made with rice. Explorers brought it to Thailand where it quickly became popular. Then, during World War II, both war and floods led to a rice shortage in Thailand. Since rice was one of the country’s leading exports, the government encouraged people to use noodles instead. And thus was born this delicious, noodle-based variation which has become so popular and well-loved throughout the world that it’s been called one of the world’s most delicious foods. It is also now the National Dish of Thailand. Although this is a speedy recipe as-is, the hour before dinner is one of the busiest in our home. I like to get a jumpstart on making it by shaking the sauce ingredients together in a Mason jar in the morning and popping that into the fridge where the shrimp are already defrosting. 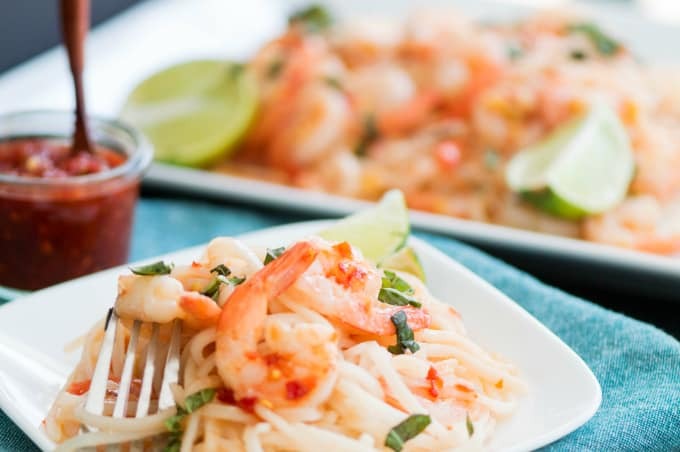 This Shrimp Pad Thai recipe will stay good for three days in the refrigerator. It can be frozen, but the noodles will absorb most of the sauce, so you’ll want to make a bit extra to add before serving. Note: This recipe first appeared on March 18, 2013. It has been revised for simplicity, and the photos updated for republication. 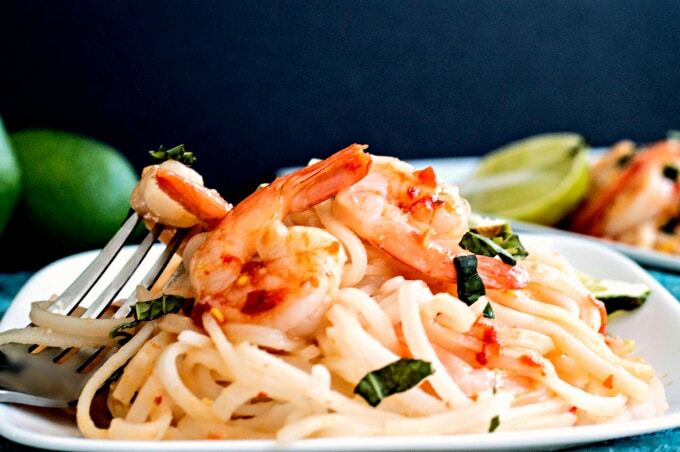 The perfect balance of spice and heat, with slurpy noodles and juicy shrimp. No wonder this is known as one of the World's Most Delicious Foods! Meanwhile, combine fish sauce, tomato paste, chili garlic sauce, lime juice, and sugar in a small bowl. Add sauce mixture and eggs. Cook, stirring constantly, for 1 minute. Add drained noodles and stir until coated with sauce and the shrimp is mixed through. Remove from heat. Serve garnished with chopped basil or cilantro, chopped peanuts, and lime wedges on the side. Golden Turmeric Milk – Anti-inflammatory deliciousness! Your recipes are terrific. I would love if you would share a few with us at my foodie friday party today. Hi! Followed you over from Ginger Snap Crafts blog hop. This looks great and I love Pad Tai. I would probably add the creamy PB the way your hubby likes it because I am not a fan of the crunchy texture. Pinned the recipe and now following via FB. This is so well thought out; THANKS a million for sharing it here with us! Oh, you are so right about the pricing… we all have to make do with less; a LOT less. Especially when faced with high medical bills. Wishing you all the very best and a tight hug for you! It’s actually a pretty easy recipe, Nikki. A lot of Asian dishes are; it’s the chopping and prepping that’s difficult.